The book, Our Common Future, is not one that most people would recognize. But most people would recognize one 30-word sentence from the book, a sentence that has re-directed the world’s pathway to a sustainable future. 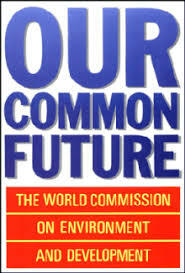 The book is the final report from the World Commission on Environment and Development, which ran from 1983 to 1987. 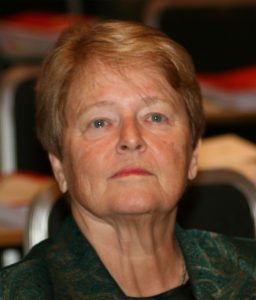 The commission was chaired by Dr. Gro Harlem Brundtland, Norway’s Minister of the Environment in the 1970s (the first woman environmental minister in the world) and later three-time prime minister of the country. Brundtland was a medical doctor by training, working in the area of public health, when she was tapped to enter Norway’s government. The environment was getting increasing attention through the decade of the 1970s, and the United Nations had sponsored a variety of limited gathering to discuss environmental problems and recommend solutions. But those efforts were plagued by two constraints. First, they were each limited in scope, addressing just one aspect of pollution, population growth, soil degradation or the like. Second, because they occurred within the UN’s political structure, their recommendations were always hobbled by the individual agendas of the participating countries. So, the UN Secretary-General opted for a new strategy: Create an independent commission outside the UN itself. That had worked well for an earlier Commission on Disarmament and Security Issues, created to address the problem of nuclear proliferation. This commission would deal broadly and comprehensively with environmental and development issues. He called on Brundtland to lead this new organization, giving her complete freedom to organize the membership, conduct the work and issue a report. Brundtland, between terms as prime minister, agreed to lead the group and began work in December, 1983. She did things differently than other commissions. She put together a team that equally represented developed and developing countries. She held meeting not in a glitzy European capital, but throughout the world, including site visits and public hearing in places with dire economic and environmental conditions. With the commission’s executive director, Jim MacNeill, she determined to produce a report that integrated the ideas of environmental quality and economic development. And they conspired to make the report the beginning, not the end, of their work. Perhaps better than any global leader, Brundtland understood the connections between health, prosperity and environmental quality. Rather than seeing the environment as something to be cleaned up after economic activity produced pollution, habitat change and public health issues, she saw the three as being inescapably connected. The commission termed the connection “sustainability,” thus defining a word that has now become the universal standard for more appropriate public policy and private actions. With those 30 words, the commission set the world on a course that has produced a continuing series of global meeting and agreements on environmental improvement, from Rio to Copenhagen and, most recently, to Paris. The commission is now known popularly as the Brundtland Commission, and those 30 words as the Brundtland definition of sustainability. Nielsen, Larry A. 2017. Nature’s Allies: 8 Conservationists Who Changed Our World. Island Press, Washington DC. 255 pages. Report of the World Commission on Environment and Development: Our Common Future. Available at: http://www.un-documents.net/wced-ocf.htm. Accessed March 19, 2018.